By Karrar Haider in Desktop. Updated on November 7, 2017 . Your browser’s private mode leaves no traces of your browsing on your PC, which is very useful if your PC is in use of other people as well. If you like keeping your browsing private all the time, then you might be interested in launching your browser in private mode by default. In this post, I’ll show you how you can make Chrome, Firefox, Internet Explorer, and Opera open in a Private mode when you launch the browser. 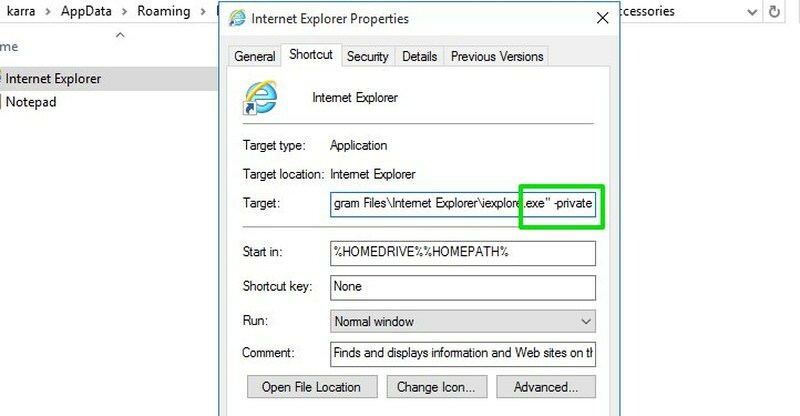 Note: Private mode can only remove your tracks on your PC, your activity can still be tracked from your network or by using a spying tool. You can modify one of the Chrome shortcuts to always open in incognito mode by adding a command to it. You can choose any shortcut for this purpose, including the desktop shortcut, Start Menu, or even on the Taskbar. Right-click on your desired shortcut and select “Properties” from the context menu. Here under the “Shortcut” tab, add -incognito at the end of the “Target” string. For instance, ...\chrome.exe" -incognito. Do note that there is a space between the ending quotes and the dash. Now click on “OK” and the shortcut will be modified. 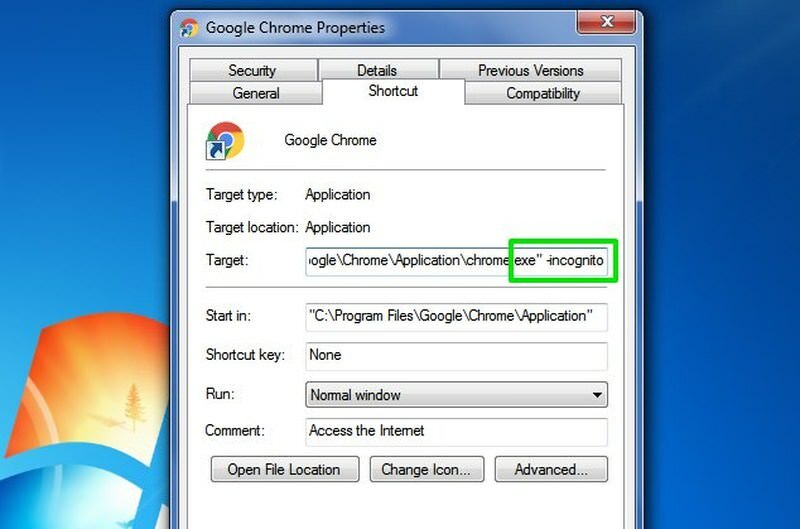 Whenever you will access Chrome from this shortcut, it will open up in incognito mode (private mode). There are two ways you can force Firefox to always open in private mode. You can either modify its shortcut or enable this feature from Firefox options. In Firefox, click on the hamburger menu at the top-right corner and select “Options“. 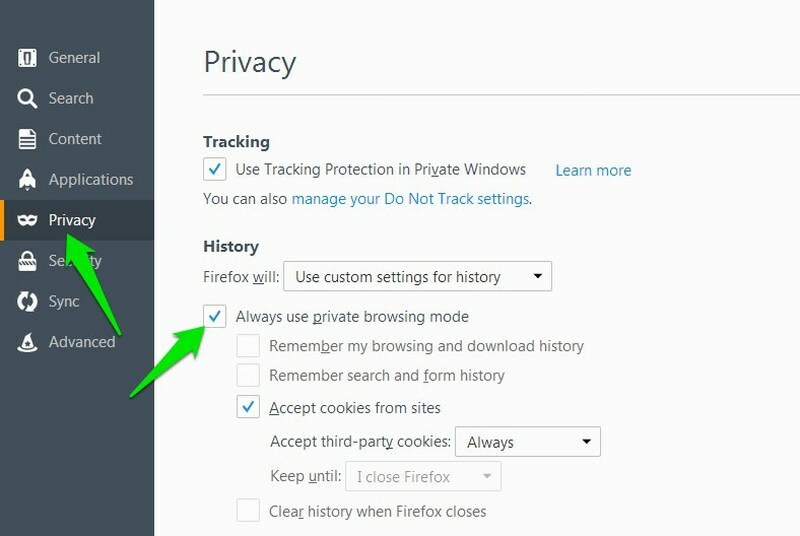 Here move to the “Privacy” and check the checkbox next to “Always use private browsing mode” under the “History” section. You will have to restart Firefox for these settings to take place. Now whenever you will open Firefox from any shortcut, it will open up in Private mode. Although the Firefox Private mode icon will not appear at the top of the browser but don’t worry you are still browsing in private mode. Right-click on any of the Firefox shortcuts and select Properties from the menu. Now add -private at the end of the Target string. Make sure you add a space between the quotes and the dash, like this "....\firefox.exe" -private. 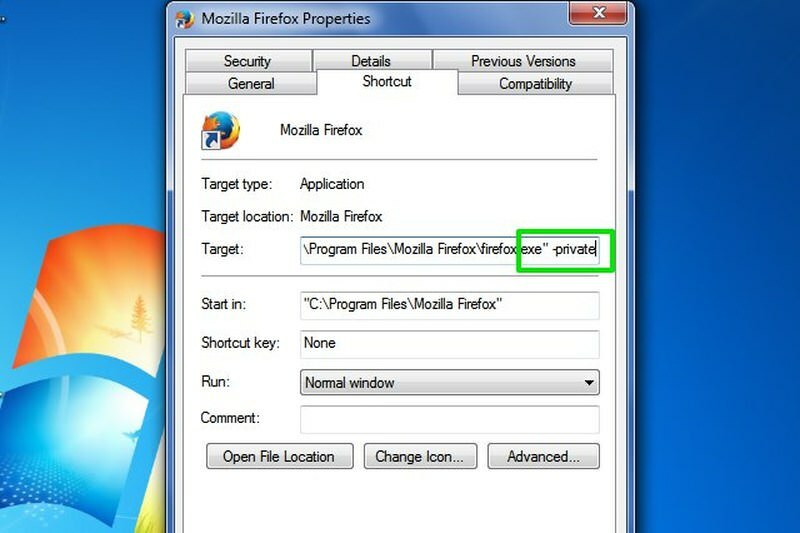 Click on the OK button to confirm the change, and when you will open Firefox using this shortcut it will open in Private mode. You will see the usual Private mode page along with the Private mode icon at the top of the browser. Right-click on any of the Opera shortcuts and click on Properties from the context menu. Similar to Firefox, you need to add -private at the end of the Target string with a space between the quotes and the dash. Finally, click on the OK button to apply the changes. 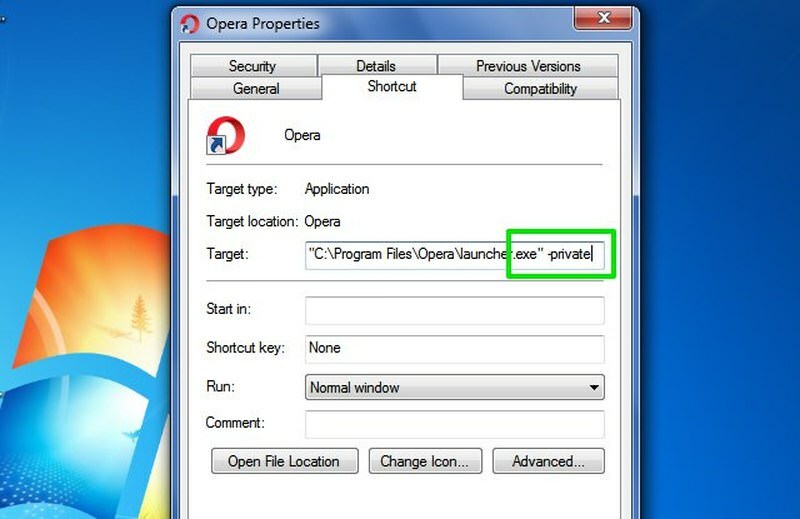 Launch Opera using this shortcut and it will launch in Private mode. Similar to other browsers in this list, you will also have to modify the Target box to make Internet Explorer open in Private mode by default. However, in Windows 10 you will have to edit Internet Explorer’s original shortcut inside Windows Accessories, this will not work for custom made shortcuts. To access the original shortcut, type Internet Explorer in the search bar and right-click on it. From the menu, select Open file location. 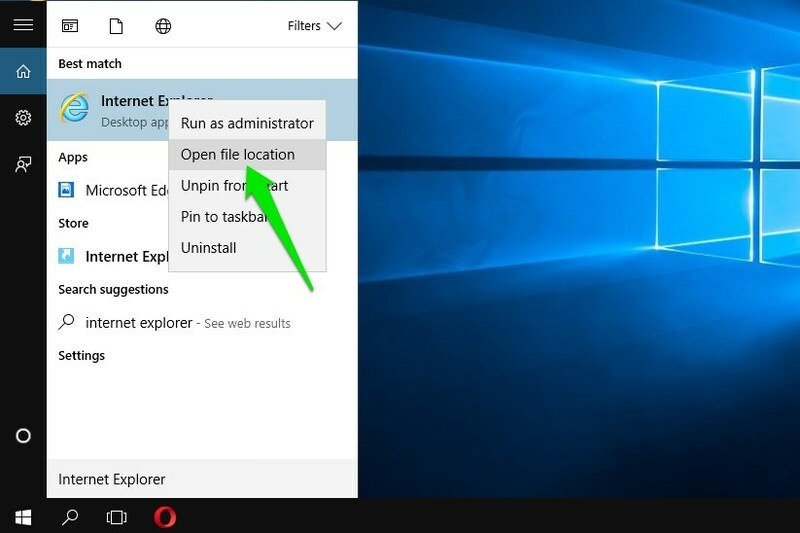 Windows Explorer will open up and you should be able to see Internet Explorer shortcut here. Right-click on it and then click on Properties from the context menu. Now add -private at the end of the Target string and click on OK to confirm it. Now you can access Internet Explorer from any shortcut and it will always open in private mode. It seems both Safari and Microsoft Edge don’t allow you to change the default launch settings. For Microsoft Edge, I have tried modifying its shortcut from different areas. Either the Target box was uneditable, or nothing happens after making the edits. For now, you’ll have to manually launch the private window when you will open the browser. I will recommend you to create a separate shortcut for launching your favorite browser in private mode. As private mode also delete cookies and other useful information about the sites you visit, you may like to browse some website in normal mode for the ease of access. Additionally, if you ever need to stop your browser from opening in private mode, simply revert the changes you have made.